Essex based Away With It provide budget-friendly skip hire, amongst numerous other services, throughout Essex and North London. The professional waste removal company are fully licensed and insured, which gives their customers peace of mind that their waste is being handled appropriately, abiding by all regulations. At Away With It, we understand how tedious it can be living with household waste cluttering your home. More often than not, people just don’t know what the best course of action is. The answer is Away With It. We provide customers with bespoke skip hire packages specifically tailored with every requirement they have in mind. If you have never hired a skip before, let us talk you through the options available from us and how we can help you get rid of your unwanted waste, when it suits you. Away With It have been offering skip hire in Waltham Cross for over 15 years, which means we know exactly what you want. We regularly see customers returning to us as they have been so impressed with previous jobs we have completed for them. We are championed for our cost-effective solutions, but our timelessness and flexibility is also a real draw for old and new customers alike. Being open seven days a week, between 7am and 11:30pm, means we are always on the end of the phone when you need us and we can provide skip hire services that fit in with your plans. You can pick whatever date you like and a time that suits your perfectly. Sometimes, if we have availability, we can even drop a skip off to you that very same day. We like to make our customer’s lives as easy as possible, so don’t ever be apprehensive about calling to let us know any changes or special requirements. It’s all about you. Once your perfect skip hire plan has been put together, we will make sure we have the full details of the job and are prepared well ahead of schedule. Our skip hire teams will give you a ring when they are on the way to your property, just to touch base and give a specific time of arrival. Whatever your circumstances, get in touch and we can create a strategy to make sure your unwanted household waste is out of site as soon as possible. If you don’t have the room for a skip, or simply want a different option, we have a very popular alternative to traditional skip hire. Our two-man waste removal teams can travel to your home and clear any waste you want rid of in a flash. These teams are a fantastic option for those who only have a couple of items or are seeking same day removal. Furthermore, it is an incredibly affordable option; you will only ever pay for the final volume of waste removed, as opposed to ‘loads’. Whether you want to clear an entire house of clutter, or have one pesky broken fridge, no job is too big or small. Our two-man waste removal teams will do all the lifting and leave your home spotless. 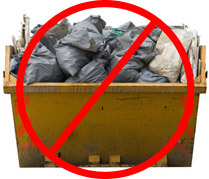 Skip Hire or Waste Removal in Waltham Cross? Having a choice of skip hire or waste removal team is a great situation to be in, but we understand that it can be little confusing as to which is the best option for you. A great idea is to give one of our friendly advisors a call and they will be able to talk you through the benefits of each. Alternatively, we have experts on hand to visit your property and assess the job that needs doing. They will be able to give you the best option and give you a no obligation quote on the spot, helping you to decide. Whether you opt for waste removal or skip hire, you can rest assured your waste will be out of site as quickly as possible. To discuss your options for skip hire in Waltham Cross and get a competitive quote please contact us at 0208 504 7390 or 07957 123 019 for further details.